When we were offered the chance to review a bath soak I instantly saw a way to score brownie points with the OH and volunteered to put his views forward. 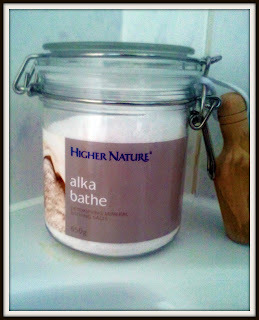 Higher Nature are a supplier of vitamins and supplements and we were sent Alka-Bathe to review. In our house baths are a real luxury for adults, which contrasts to the routine of baby baths. As I'm not a fan of baths the OH was very happy to be given the opportunity for an excuse for a bath. He loves baths, probably becuase he understands how much they can help a body reccuperate. He plays squash every day, he'd play more often if he could. I get tired just watching a game. 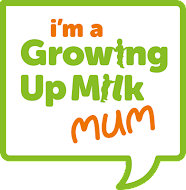 So, one morning when mum had the twins and Squeaks was at pre-school, Mr J went up for a bath. Not that we have routine in particular, but when I realised that it was getting on to the time he gets ready to pick Squeaks up I went to find him. And there he was, snoozing in bed. "Alka-Bathe provides alkalising minerals (Potassium, Sodium bicarbonate and Silicon dioxide) for a complete detox. Cleansing and detoxifying the skin by drawing out acid waste products, it is also relaxing and soothing - comparable to a hot spring spa." And the penny dropped, he couldn't believe he had fallen asleep, it had done its job at relaxing, but I have created a monster- he went on that night to win his match, and he has decided to make the link with the Alka Bathe, it's a wonderful logic, but as it's worked two weeks in a row I've got no way out. So, our bathroom has been transformed, bye bye baby toiletries, hello Alka Bathe. For anyone who wants a bath to make your body feel healthier this seems to be the business. To me the fact it's not fragranced adds to the benefits- it doesn't contrast with your aftershave or perfume. Given it seems to have balanced Tony's diet with looking after his body on the outside, it has provided the mssing link. Alka-Bathe is available in jars of 650g or 450g. For the purpose of the review we received the 650g jar, which is packaged in an airtight container, and comes with a separate scoop. The larger jar retails for £20.95, while the smaller jar is £14.95. These are available from Higher Nature, a supplier of vitamins and supplements. All round to yours for bath and bedtime story then?